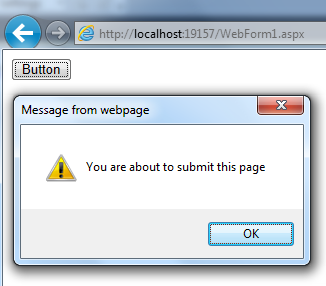 The Button, LinkButton and ImageButton controls in ASP.NET are used to post a page to the server. 1. Button - The Button control is used to display a push button. Use the Text property to change the Text on the Button control. 2. LinkButton - LinkButton displays the button like a HyperLink. Use the Text property to change the LinkText. 3. ImageButton - ImageButton provides the flexibility of associating an Image with the button, using the ImageURL property. All the 3 button controls support CommandName and CommandArgument properties. We will talk about these properties in the next video session. These 3 button controls also support CuasesValidation and ValidationGroup properties. We will discuss about these properties, when we talk about validation controls in asp.net. 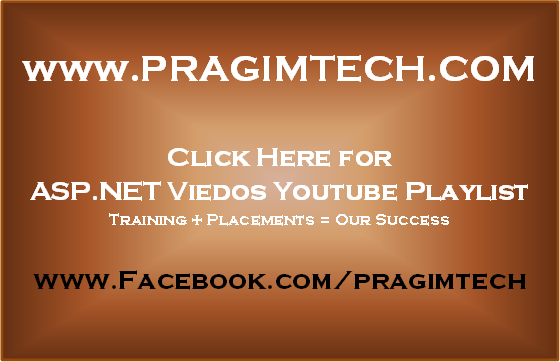 We will discuss about PostBackURL property, when we talk about cross page post back. OnClientClick="alert('You are about to submit this page')"
OnClientClick="return confirm('Are you sure you want to delete this record?')" When you click the button now, the user will be shown a confirmation box, as shown below. If you click cancel, the confirm() function returns false and the webform will not be submitted. If you click OK, the confirm() function returns true, and the webform will be posted to the server.